The island of Hvar in Dalmatia was ranked in the Top 10 most beautiful islands on our planet. Hvar is considered a first-class resort that offers everything and everyone can find what they seek. Island Hvar is the queen of Croatian Dalmatia. 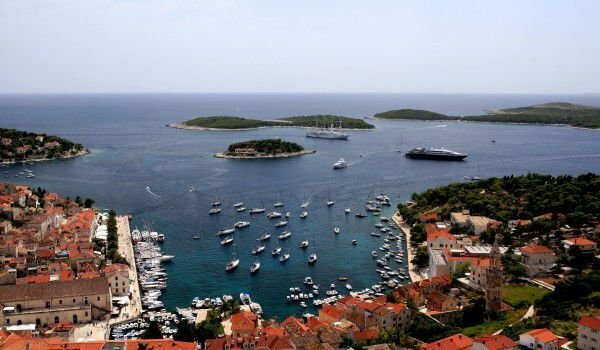 Since antiquity it was a significant point because of its strategic position in the sea, and then taking the most valuable parts of all historical periods, resulting in Hvar being able to boast of many historical monuments and cultural events. On the island of Hvar one lives in harmony with nature among the meadows of lavender, old olive trees and vineyards. The town of Hvar is one of the most interesting and enjoyable places on earth. Located between Split and Dubrovnik, Hvar can be reached by ferry or boat from Split and Trogir against an small amount of 300 euros in one direction, suggesting that the rest of the island will come out quite expensive. Local Croats themselves even say that to rest in Hvar is a matter of prestige and opportunity. City of Hvar is the biggest town and tourist center of the island. It is situated around a quiet bay, overlooking the Pakleni Islands archipelago. Around the coast of Hvar are beautiful perched villages turned into resorts. The town of Hvar is a cosmopolitan village with modern marinas, first class hotels and countless restaurants. The mild climate and scenery, ancient architecture and the many sights help in the enchanting village becoming a place of rest. ThepPanorama of sea waves to the city includes beautiful and exotic palms, seven centuries old walls that wind up to the fortress of Hvar, dominating from its hill above the city. The central square of Hvar is named Sophia and is considered the largest and most beautiful in Dalmatia, stretching over an area of 4500 m2 At its center is the large 16th-century St. Stephen's Cathedral, and in one corner of the square is palaces of Groda, and another - a Burag, built of stone blocks and cascades. From Sophia you reach a modern gallery in Hvar Theatre and the city, established in 1612. In the south of the central square is another major historical landmark of Hvar – the Franciscan monastery from the 15th century, which today operates as a museum. Here are Arsenal and the governor’s Palace. Go north of the center of Hvar and reach the castle on the hill, which was built more than five centuries ago. Another major landmark of the city of Hvar is fortress Fortica or fortress Spanjola, rebuilt in 1579 after the exploding of the old fortress. In the northern part of the big square building is located a Renaissance style palace known as Paladini Palace, and the unfinished Hektorovic Palace, built in Gothic style in the 15th century. Hvar is one of the most important and ancient places of Croatian culture, literature, architecture, sculpture, painting and music. In the summer, from late June to late September in the city is the summer festival of Hvar, which passes with many concerts of classical music performed by national and international artists and amateur performances from Hvar. Leaving aside the cultural life in Hvar, and focusing on the night, it is certain that nobody can be disappointed. On the whole coastline and marina, in a semicircle line up one after another many restaurants, pubs and bars. During the day you should make time for a boat trip to some of the Pakleni Islands.